After a Gardeners of Peace visit to the politician’s garden, I’m changing her moniker to head gardener for the Gops. We other three wandered around admiring everything. From the head gardener’s Craftsman cottage, a walkway under flowering dogwood trees leads to flowerful perennial beds – tall lilies lean out, small blossoms spread below. Plump plants of lavender border a handsome arbor near orderly vegetables, ripening raspberries, and a charming chicken house. It’s a picturesque scene. Then we came upon a “secret space” – a glade hidden by trees, real geraniums, and a carpet of perfect grass. This green room was furnished with a hammock, and a picnic table laid with colorful tablecloth and tea treats: lemonade and iced tea to mix or not, deviled eggs in a deviled egg dish (no untoward jiggling off the plate), spicy cucumbers, bite-size chunks of ripe watermelon, a bowl full of cherries, crusty real bread, and gorgeous scones and jam! A chance to catch up in a glorious summer setting. We talked trips mostly – and the librarian, being fond of details, asked me about travelling and painting, how did I do that? “Because of my painting kit,” I thought later driving home – a seven-inch by eight-inch zippered pouch of rip-stop nylon. Small and light, it contains a tiny, simple studio for a watercolor painter: a pocket-size box of paints with the original pans of pigment pried out and replaced by squeezes of tube watercolor. The paint box came with a little take-apart brush (the brush stores in the handle), and I added one with a better point. On the faded and worn cardboard cover of the box is a watercolor scene – a classic English painting, surely by Winston Churchill or Prince Charles. Mostly I work in my journal on a trip – but the kit contains cut pieces of hot press paper and a tiny drawing pad. Tape from a small roll can turn a folded-over piece of paper into a letter to mail. The cut-off end of a square plastic juice bottle holds just enough water for painting, and tissues from a tiny carton blot an overloaded brush. Colored pencil stubs are handy when water is not available, and color is called for. The little kit holds a lot of memories of places – adding color to drawings on mountain trips, in airplanes – or sitting up in the early morning with cup of tea in a hotel bed. Even when not accurate, little paintings, colored drawings say something different than photos. They represent moments of concentrating, the moments of effort I cherish. I didn’t have the kit with me, but would have liked to linger in the head gardener’s glade to capture some part of her summery scene. But that wasn’t quite what I saw. The trail begins in a stand of old growth trees – the firs and hemlocks aren’t so enormous in girth as they are tall – so tall you trip backwards attempting to see the tops. Under those trees, we hiked in a chlorophyll-filled world, following a clear non-glacial stream, through the green glow of forest. Not a room exactly but more like being inside a leaf – a journey along veins and ribs – with the sun shining through. Moss covers logs beside the riverbank, like a thick green version of the fuzzy white lining of fava bean pods. Shiny leaves on plants of mahonia and queen’s cup, moss, ferns, and kinnikinick cover the ground to each side of the trail. Miniature woodlots of lime green seedlings grow on nurse logs. One huge stump’s roots lie nearly in the river with a tiny fir forest fuzzing its top. An orange columbine caught my eye, but mostly there is no color beyond the gradations of greens. The ascent is kind because of a gradual elevation gain and bridges made from logs – both bridges with hand rails and flattened tops built by the Forest Service (it’s thrilling, but safe, to stand on a log in the middle of the river) – or bridges created by nature, casual downfalls slippery with spray, reaching across a snow-melt creek. Camp Handy – our turnaround point three miles in – is a wooden shelter next to a sunny meadow. Gravel bars, surrounded by a thick stand of willow, edge the river. Mountains enclose this long valley. We spread windbreakers on a groundcover of wood strawberry and moss, ate tortilla de patatas sandwiches (contained by panini buns this time), and watched yellow butterflies on buttercups and cow parsley. The night before I sautéed golden turnip greens with onions and garlic, and added cannellini beans cooked with sage. Classic beans and greens. And a side of fava beans – the outer felted pods removed and beans sautéed in a little olive oil with garlic. So, easy dinner this night would be the leftover beans added to a salad made from a gathering of greens – several different lettuces, avocado, snow peas, small chop of broccoli, spinach, frilly Savoy cabbage – and an orange highlight from a sliced nectarine. Olive oil with Meyer lemon and blackberry balsamic vinegar (treats brought by a friend from the Pike Street Market in Seattle) will quickly combine into a delicious salad dressing. In and amongst all those greens I saw in the forest was fava bean green – the green of the tender inside part, teased from its husk and eaten with pleasure. I’ll add those in. Beans and greens. Fewer deer live out here on the bluff than in some parts of town, so it’s mostly a privilege to see them so close by. They eat pineapple weed and cat’s ears from the lawn, and offerings from the bluff thicket. A doe and her fawn visit nearly every morning – the fawn all gawky exuberance – the mother more cautious. Skittish sometimes – a sudden noise leads to a deer exit offstage, head nervously bobbing in a back and forth loop. When we bought our property the lawn edged right to the bluff and then fell over. The bluff is undercut in places, but it isn’t a sheer drop all along – from the beach you can see clumps of stabilizing trees and shrubs. We built a fence the first year – one of those ubiquitous green-metal-wire with white-topped-posts fences, and placed it back from the bluff with the hope that plants could fill in, and it would disappear. The abrupt and naked edge became an impenetrable blockade the height of the fence – a tangle of salal, wild roses, honeysuckle, ferns, vetch, and native blackberry. (This year a single stalk of Columbia lily with spotted and reflexed petals emerged above the thicket.) We can trim the thicket a little, by reaching out from this side of the fence. When sheared this way, the ocean spray blooms in a froth – and looks just like its name. Later, when the thicket is full of salal berries, a deer will jump the fence – daintily leap from a stopstill and land carefully – wallow in belly-high berries, eat its fill, and jump back. Pleasures outweigh any loss of view – bees at work become the sound of the thicket, and hummingbirds hover near vetch blossoms. Birds perch on branches near three wooden chairs in a small, well-mowed spot. Last summer when my young friend and her mom came to visit, we sat happy hours there, listening to songs of sparrows, drinking tea, and taking turns reading a book out loud. Summer! When recent visitors asked if the thicket was all natural – meaning did I plant any of it – I wished I could take credit, because it answers Stein’s hope – a lovely jumble of favorite natives – supporting wildlife – giving pleasure – and lasting for a long time. Recovering from the Mount Townsend hike, the next day we reversed our morning route up Artillery Hill in Fort Worden. It’s still a climb, but gentler. We walked the track through newly mowed meadow and forest, and looped around at the top to start back past Fort Worden’s bunkers. These low-down buildings – gun embankments dug into the earth with window slits looking out to sea – were built at the end of the 19th century as part of a military presence on the Strait of Juan de Fuca. When we first came here, the buildings’ concrete pillars and steps were moss-covered and looked exotic like ruined temples. Now graffiti threatens the gray of the concrete, but dedicated volunteers or park staff cover it with rolled-on paint in neutrals of loden green or a kicked-back turquoise. Walking here, away from the waves and wind, birds cheep in trees above, but buildings, with doors tipped on rusted hinges, are silent. Sometimes I picture soldiers about their business, training business, and think how loud the guns would have been. I also think about our boys when we walk here – how much they would have loved these buildings when little – these structures would have fired up their imaginations, and inspired mock battles for sure. But I always think about them when walking. We walked a lot as a family – on trips and Alaska trails. I remember carrying the first born in an old Gerry pack through a mountain pass as a not quite two-year old, and thinking how, having already seen such sights, his view of the world would be different than mine. (He wasn’t looking at scenery, but focused on what he called “buedubbies” – requesting I reach down and gather more.) By the time of the younger son, we rigged a red Kelty pack with a kid carrier down inside it, and the older son began to walk with his own red pack. I always wondered if they’d like to walk when they grew up. But I wonder no more. They both have rambled the world, dividing the globe, and added in plenty of uncharted Alaska treks, mountain climbs, and backcountry ski trips. The older son and his wife did a long and hard trek this summer, many miles, many days, carrying their gear. I loved what our son said before they left, that he was looking forward to days of walking and walking. That strength and hiking competence is part of the overall power shift from parents to children. I wonder if young people realize how much parents love to see that transfer. I’m glad not to be the trail boss. For a long time I have been aware of the wisdom of our sons – their intelligence and self-possession. I think parents just want to be still relevant somehow – but know that doesn’t mean being in charge anymore. 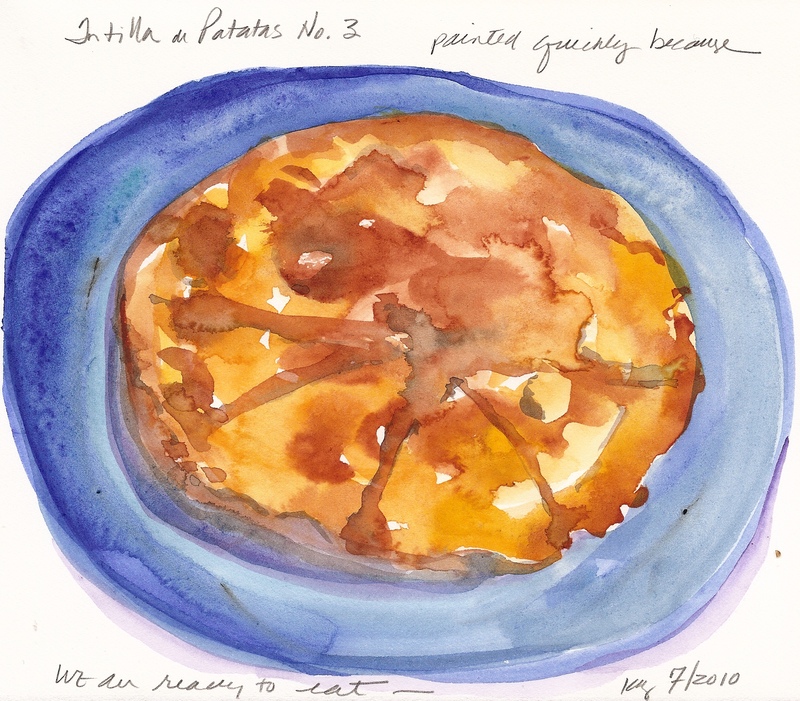 Called a tortilla but really a frittata, Deborah Madison refers to this egg and potato treat as Tortilla Español. In Catalunya it’s tortilla de patatas. Deborah’s recipe calls for a lot of olive oil – two pounds of sliced potatoes cooked in five tablespoons of olive oil. Leery of so much oil in spite of eating so many authentic tortilla de patatas with olive oil at full strength, I’m in the middle of a Goldilocks test. This frittata might become a staple, especially in summer with so many eggs and new potatoes – and leftovers being perfect for hiking trips – I’d like to get it just right. The first time I peeled the potatoes, but just gave the second batch a good scrubbing (they were new potatoes from the farmer’s market with very thin skin). The first time I sliced and parboiled the potatoes a little before adding them to the sautéing onions. Good. The second time I cooked the onions in water, drained well, and added along with the cooked onions to the eggs. Also good. Third time? I plan to try all the olive oil. The first time I finished the frittata off in the oven, and the results slipped easily out of the pan and looked a golden beauty on the plate. The second time I tried to follow Deborah’s directions by sliding the omelet to a plate once one side was golden brown, and then returning it to the pan to continue cooking. That requires a little more manual dexterity – my puffed perfection was a little cracked. Still good. Deborah says the olive oil gives the potatoes a “velvety, tender texture.” I’m sure she’s right (and probably an easier slide from the pan), but these attempts both tasted very good. I like how Deborah describes this most common Spanish snack as “providing a nourishing boost for flagging energy from morning through night.” Wanting to get an early start on a hike, I sliced it into a baguette and made huge and delicious sandwiches for the drive to the trailhead. Next time I’ll buy panini buns – they’d make it easier to keep all that goodness out of our laps. Oh – and I broke open the tomato preserve – it is exactly what Carmen called “fruit preserve” – rightly so, tomato is a fruit. I sliced it into the sandwiches – perfecto! At the trailhead for the Mount Townsend hike, the sun is hot in the dusty parking pull-off. You can look up and see the summit far above. Just an hour’s drive from town, this seven-mile hike is a summer ritual for people here. A twisty Forest Service road provides much of the elevation gain to the 6,280-foot summit, but 2,000 feet remain to do on foot. Edged at the beginning by pale pink and blooming rhododendron, then by the logged stumps and regrowth of hemlock and Doug fir, the trail climbs relentlessly up for the first half-hour. Ever upward, the route switches to the mountain’s damper flank, covered with fern and kinnikinnick. On a clear day walkers can glimpse the Strait through trees, but a couple of Sundays ago when my husband and I hiked, a thick layer of fog and cloud covered the water and coast. About 40 minutes up, the trail levels briefly, and at 50 minutes we stepped through snow patches. Two years ago we hiked the trail on the 21st of each month, June to September. That year in June, at this spot, we slid and sunk into significant sweeps of avalanched snow, and heaved over many winter downfalls. Remembering the measured pace of the trail boss, at an hour and a quarter on a slope of rocky outcroppings, we stopped for a handful of nuts and some water. Just a few switchbacks below the top ridge, here the view stretches west across forested valleys to the beautiful snow-streaked Olympics. The high tree line in Washington always surprises me, but at this elevation trees become stunted and sub-alpine. Now in early July, pale lavender and white phlox, tiny violets, and unopened allium grow in patches of scree. Later in July kamus, monkshood, potentilla, saxifrage, paintbrush, and lupine will bless the tundra. On the top of Mount Townsend, narrow but a mile long, summiters find resting spots and a spectacular view. But on this day, a thick cloudbank obscured all but the nearest tree-covered foothills and the snow-clad volcano shape of Mount Rainier. On our August and September trips the view was a 360° panorama – to the north all the way to Canada, the Strait of Juan de Fuca, Discovery Bay, and the Quimper Peninsula. To the east, in front of the Cascades, Puget Sound and its by-waters twisted and turned. We could see the Hood Canal Bridge, follow the highway across Bainbridge, and watch ferries carrying people back and forth to Seattle’s buildings, glinting in the sun. We ate cheese sandwiches and apples in a little grassy bowl near a long patch of snow, sheltering by wind-twisted juniper. A breeze and clouds passing over the sun made me glad for windbreaker and wool shirt. One of us had a nap, and the other painted a little scene. Chilly, we started down. Down is quicker but hard on knees, boots slip on rocks and dust. Halfway down it felt good to sit on a tree trunk over the path and split a big chocolate-chip cookie. I was glad to reach the car and look up to see clouds swirling about the summit. And glad to drive home eating cherries, hoping the fog had lifted off the bluff. On a drizzly day, before I began to clean up the rest of the garden, I tidied our old dog Bill’s grave on the south forty. I cleared the beginning-to-rust can that holds greens in winter and flowers in summer, and fashioned an insert from a yogurt container. Thick grass (well, grass and weeds) surrounds the gravesite and encroaches. Neglected while waiting for the daffodil foliage to mature, then we were gone, and now it was just unkempt. Winter rains and winds tattered the prayer flags and knocked down the stone stacks we build up in the summer to mark the grave. I gathered flowers deer avoid to fill the can, and thought about Bill, and also about the photo my painter friend sent of my parents’ gravesite in Anchorage. Two little markers in the old downtown cemetery. My friend visited them on Memorial Day and placed a bouquet of early spring flowers from her Anchorage garden. I was touched. Cleaning up the debris on the big stones covering Bill’s grave, I thought about people forever tending gravesites. Like those depicted in the movie “Forever,” about the Père Lachaise Cemetery in Paris – French women brushing and polishing marble of loved ones, and leaving flowers. I wondered about having a place to go for remembering – a place where the act of tidying is devotion. Comparing that to scattering ashes in a meaningful place. My friend here on the bluff built a beautiful memorial for two beloved animals – a horse and a dog, Charlie. One day the Garry oaks she planted will grow huge. Some of these thoughts come from travelling in a country with so much history, so many memorials, so many stone houses hundreds of years old. Been thinking, too, about how even our wooden house will far outlive us and feeling inclined to paint the year of building over the door – even if not carved in stone – and maybe consider other permanent marks that say we were here. Rain and dark clouds encouraged these thoughts. Glad to shake them off, I headed back to the house and the Buffalo to cook and make the bed for cheerful guests coming to stay. The important thing is paying attention to this life now. We’ll light a fire and tell stories like people do.